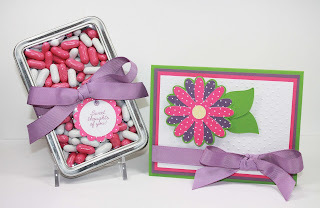 Simply Pam: MPS Spring Treats Design! When I was thinking about what to do for this project I realized Mother's Day was coming up and wondered what my Mom would like. Her favorite candy is 'Good & Plenty' and they just happened to be the right colors I was looking for! The flower was cut using the Forever Young cartridge and the leaves using the Give a Hoot cartridge. All of the paper and ribbon is from PTI. I also used the Swiss Dots Cuttlebug folder. On the container I used the My Pink Stamper's Simply Sweet Occasions stamp set which you can get at Custom Crops. I used SU! punches for the tag. I got the tin container from Specialty Bottle. Be sure to check out Amy Jo's project by going to the My Pink Stampers site. It's fabulous! Also, if you haven't submitted your name for my blog candy be sure to sign up as a follower and leave a comment HERE with a way to get a hold of you. Today (Tuesday) is the last day to enter. Oh, Pam ... this is so pretty. I love the flower! What a great gift for your mom ... just lovely. How cute! They compliment each other perfectly. Great job! Pam...these set is so very pretty and the colors are so crisp and clean looking. What a nice treat this is, TFS! OOOOOO I love it! So yummy looking. I bet your mom will LOVE it! What an adorable gift set!!! These are so cute. I really like the colors, very spring. Hi Pam, sorry I wasn't here yesterday:( I had NO internet!